The original Nash Bullet Mono was regarded by most top carpers across the UK and Europe as the best monofilament mainline available. Due to a policy change, our suppliers stopped producing the incredible Bullet Mono over 3 years ago and#8211; A disaster!! For the last 3 years we tested and rejected literally hundreds of mono lines from around the world. At last weand#39;re delighted to announce that we have found a manufacturer that is able to produce a new line to our exacting standards. In fact, our new line is far superior, for this reason we have re-branded and bring you NXT D-Cam Mono! 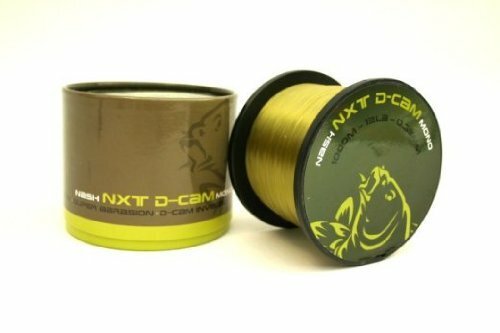 NXT D-Cam Mono features all the world leading properties that anglers have come to expect from Nash Bullet but with one significant edge. NXT Mono embodies D-Cam (Diffusion Camo) making it invisible when on the lakebed ! Kevin Nash commented and#8220;I was beginning to panic as my stock of Bullet was running out. Now Iand#39;m delighted, Iand#39;ve got the abrasion resistance, excellent knot strength and reliability of my old Bullet but with the benefits of Diffusion Camo and#8211; It doesnand#8217;t get better than that!